Lose yourself in the addiction of Diesel Loverdose Eau de Parfum, a hypnotic fragrance that inspires feelings of passion and sensuality. The scent is a secret weapon of seduction. A beautiful but deadly narcotic for the senses that feeds those who are hungry for a taste of infatuation. Let go of your inhibitions and indulge in the obsession of Loverdose, a woody gourmand fragrance that stimulates the hypothalamus, the part of the brain that induces attraction and desire. Passions are ignited like never before, and the imagination runs wild. 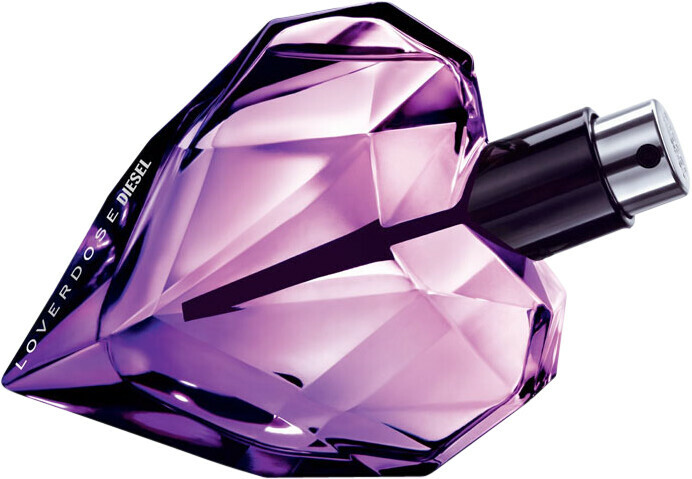 Diesel Loverdose Eau de Parfum Spray is rated 4.9 out of 5 by 7. Rated 5 out of 5 by cjbs from amazing scent i bought diesel tattoo and loved it, Loverdose is slightly sweeter but still amazing and lasts! Rated 4 out of 5 by BenCarl12 from Great Product. Love the smell! Bought for the fiancé at Christmas. Nice bottle design and the smell is beautiful. Would certainly recommend. Rated 5 out of 5 by vivabear from Heart winner Loverdose comes in an eye-catching beautiful bottle. This is a sublime scent of many layers; exotic, sweet but not cloying and woody. Never has liquorice smelt so good but then it is teamed well with other head-turning ingredients. Loverdose lingers for hours. I absolutely love it. Rated 5 out of 5 by Rachel32 from Very original Diesel Loverdose is such an original fragrance, it's sweet with a touch of fruitiness but has depth to it. I can't think of any other fragrance which this compares any similarities to. It's depth must come from the liquorice note in it which you can clearly smell. I really hate liquorice and don't particularly like the smell (in the food sense) but in this fragrance it's quite addictive and the vanilla softens it. Lovely fragrance for young and old alike. My teenage daughter wears this as does my mum, so it's universally appealing.